Fun and adventure at Aquafun Avoca Lake, at Avoca Beach on the Central Coast. 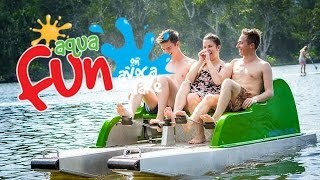 Aquafun Avoca Lake is a 'must do' Central Coast experience. Hire from a huge selection of pedal boats and kayaks, or try stand-up paddle boarding. Aquafun is located on the shores of Avoca Lake, an enclosed large coastal lagoon with a large island and lots of bays and wetland to explore. An idyllic park location with shady picnic and barbecue areas, it is just 100 metres from the heart of Avoca Beach shops and cafes, a children's playground, and just 100 metres from the beach. Aquafun is a great Central Coast activity suitable for the whole family. Relax under the huge fig trees in the reserve and watch the kids or go on an adventure of your own. Something for all the family.